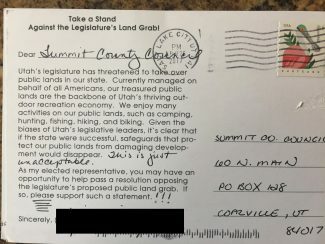 The Summit County Council has received emails and postcards like this one from constituents expressing their opinion on transferring federal lands into state control. Most have sided with leaving them under federal control. The Summit County Council will discuss in Wednesday's work session whether to work with a 2017 examination to revive the Utah Public Lands Initiative and/or pass a resolution supporting the management of public lands under federal control. "We have quite a bit we could gain from [the Utah Public Lands Initiative] as a county, but at what cost?" Council Vice Chair Kim Carson said. According to Council Chair Chris Robinson, Summit County, with its tourism and recreation-based economy, is more comfortable with federal oversight of public lands. "We don't have federal land management conflicts [like some other Utah counties]," Robinson said. "We're dealing with a different set of cards." Summit County created its own proposal to be included in the original bill after initial conversations began with counties in southern and southeastern Utah that were most affected by federal land management scope and practices, said Carson. Some of the benefits Summit County would gain by working on a revised PLI, which Carson believes could remain in a 2017 bill, include small pieces of land transferred to county's and/or Park City's control, more wilderness areas on the north slope of the Uintas, maintaining protected human-powered recreational areas, as well as updating grazing and watershed protection practices. The marked-up bill that came out of the U.S. House of Representatives' Natural Resources Committee last fall, however, made significant changes to passages containing Summit County's proposal, which ultimately led to the county's withdrawing its support of the entire PLI. Carson recently met with staff from U.S. Representative Rob Bishop's office, as well as advocates for the grassroots "Keep Public Lands in Public Hands" campaign. 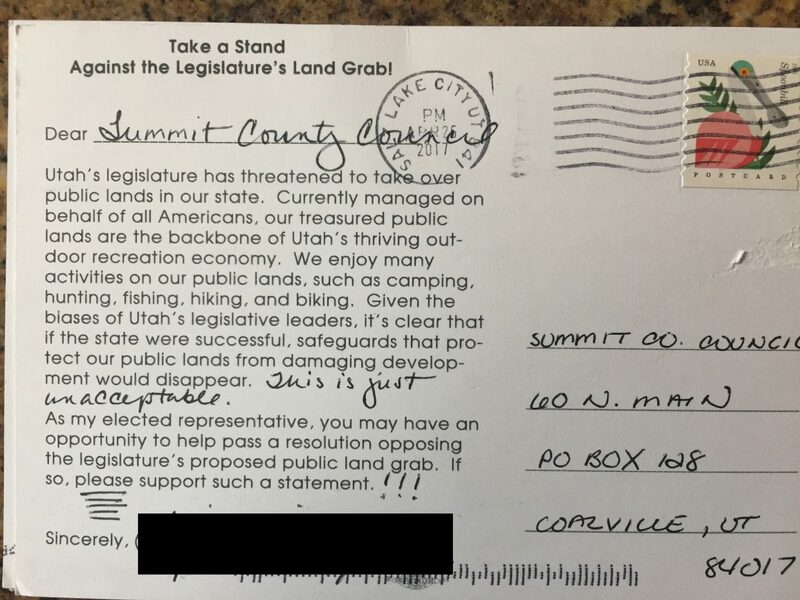 The campaign includes opposition to the governor's and Utah Legislature's efforts to transfer land management into state hands. The proposed resolution would oppose the State Legislature and the governor from spending state tax dollars to attempt to transfer federal lands to the state. Salt Lake City and Castle Valley are among the cities that have passed such a resolution. The County Council has received postcards and email messages supporting this kind of resolution. Although the language of the letters are largely mass-produced, Robinson said he has recognized many signatures as constituents. Those messages will be taken into consideration during the discussion, Carson said. While the council will use Wednesday's meeting to explore what their position on public land management will be, it is too early to see how committed Bishop is to introducing a new bill, Carson said. "The version of the bill we discussed [with Bishop's staff member] was the marked up version from the Natural Resources Committee last year," Carson said. "We reviewed what the major concerns with the bill were: grazing and motorized recreational vehicle use… and [keeping] the protection of biodiversity in the north slope of the Uintas and watershed protection areas." Because the county's original proposal came from an extensive process with local stakeholders, future input from the county will likely look similar. "From our point of view, the things we espoused for Summit County [with the last bill], we would still support," Robinson said. Wednesday's discussion will be an issue of balance and perspective: benefits specifically for Summit County versus concerns over future management of state-wide public lands; keeping avenues wide open for further discussions versus voicing the values of Summit County, and interjecting local influence into other counties versus supporting continued federal land management. The council will discuss what actions best reflect the full values of the county. "We don't want to be an ornament on a Christmas tree we don't like," Robinson said.